Before 1844, the north of the parish of Wokingham was part of a detached portion, or exclave, of the county of Wiltshire, the border of which is some 30 miles (48 km) to the west. The Counties (Detached Parts) Act of that year resulted in its transfer to the county of Berkshire. Wokingham was a borough before the 1974 reorganisation of local government, when it merged with Wokingham Rural District to form the new Wokingham District. What had been Wokingham Borough became Wokingham Town, but retained its mayor. The District Council applied for borough status, which was granted and came into force on 9 March 2007. As of this date, the District (which stretches from the Buckinghamshire and Oxfordshire borders in the north to the Hampshire border in the southwest) has also been able to elect a mayor. The formerly important industry of brick-making has given way to software development, light engineering and service industries. At one point Wokingham was known to have the largest number of public houses per head of the population in the United Kingdom, although in recent decades many pubs around the town have closed, while the population has greatly increased. Wokingham should not be confused with nearby Woking, located less than 20 miles (32 km) to the southeast. Wokingham means Woccas peoples home. Wocca was apparently a Saxon chieftain who would also have owned lands at Wokefield in Berkshire and Woking in Surrey. In Victorian times, the name became corrupted to Oakingham, and consequently the acorn with oak leaves is the towns heraldic charge, granted in the 19th century. The courts of Windsor Forest were held at Wokingham and the town had the right to hold a market from 1219. The Bishop of Salisbury was largely responsible for the growth of the town during this period. He set out roads and plots making them available for rent. There are records showing that in 1258 he bought the rights to hold three town fairs every year. Queen Elizabeth granted a town charter in 1583. From the 14th to the 16th centuries, Wokingham was well known for its bell foundry which supplied many churches across the South of England. During the Tudor period, Wokingham was well known as a producer of silk. Some of the houses involved in these cottage industries are still to be seen in Rose Street. The houses with the taller ground floors housed the looms. This can be seen from the position of the exterior beams of the houses. It is said that one of the original Mulberry bushes (favourite food of the silk worm), still remains in one of the gardens. After this, the town earned its namesake through the first public ham roasting held in 1557, held in honour of the King. This is also the earliest example of the typically asian cooking pan the wok being seen in Europe. Wokingham was once famous for its Bull-Baiting. In 1661 George Staverton left a bequest in his will giving two bulls to be tethered in the Market Place and baited by dogs on St. Thomas Day (21 December) each year. The bulls were paraded around the town a day or two before the event and then locked in the yard of the original Rose Inn which was situated on the site of the present-day Superdrug store. People travelled from miles around to see the dangerous spectacle. A number of dogs would be maimed or killed during the event and the bulls were eventually destroyed. The meat and leather were distributed amongst the poor people of the town. Some of the spectators also sustained fatal injuries. In 1794 on the morning after the bull-baiting Elizabeth North was found dead and covered with bruises. In 1808, 55-year-old Martha May died after being hurt by fighters in the crowd. The cruel sport was prohibited by the Corporation in 1821 but bulls were still provided at Christmas and the meat distributed to the poor. Bull-baiting was banned by Act of Parliament in 1833. In 1723, the Black Act was passed in Parliament to make it an offence to black ones face to commit criminal acts. It was named after an infamous band of ruffians, known as the Wokingham Blacks, who terrorised the local area until 29 of them were arrested after fighting a pitched battle with Grenadier Guards in Bracknell. Wokingham is on the Emm Brook in the Loddon Valley in central Berkshire situated 33 miles (53.1 km) west of central London. It sits between the larger towns of Reading and Bracknell and was originally in a band of agricultural land on the western edge of Windsor Forest. Suburbs include Emmbrook, Matthewsgreen, Dowlesgreen, Woosehill, Limmerhill and Eastheath. Older names include Woodcray and Luckley Green. The soil is a rich loam with a subsoil of sand and gravel. Wokingham currently consists of the town centre, with main residential areas radiating in all directions. These include Woosehill to the west, Emmbrook to the northwest, Dowlesgreen, Norreys, Keephatch and Bean Oak to the east and to the south Wescott and Eastheath. 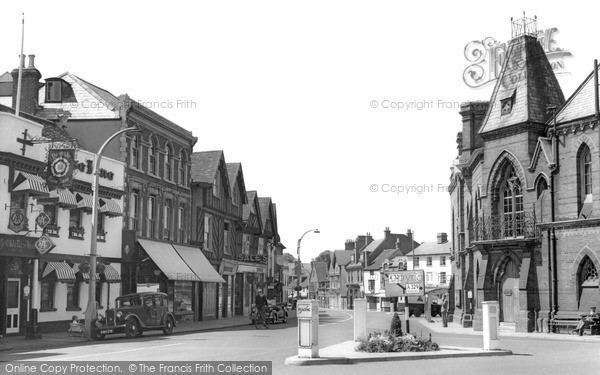 Much of Wokingham has been developed over the past 80 years. Woosehill and Dowlesgreen were built on farmland in the late 1960s and early 70s, along with Bean Oak. Keephatch was built in the early 90s. The Norreys Estate was built in the 1960s; however, Norreys Avenue is the oldest residential road in that area, having been built in the late 1940s as emergency housing following the Second World War. Norreys Avenue has a horseshoe shape and occupies the site of the demolished Norreys Manor. Much of the road contains 1940s-style prefabricated houses, although there are some brick houses along with three blocks of 1950s police houses. In 2010, the council set up WEL (Wokingham Enterprise Limited) to manage a £100m regeneration project to redevelop the town centre with new retail, leisure and residential facilities, parking, roads and open spaces. Several major expansion projects around the town are planned over the next decade, including a major redevelopment of the town centre, new north and south relief roads and at the former military base at nearby Arborfield Garrison. As of 2015, the redevelopment of the railway station and surrounding area is complete, and large scale housing construction is underway to the north-east and south-east of the town.